1896. 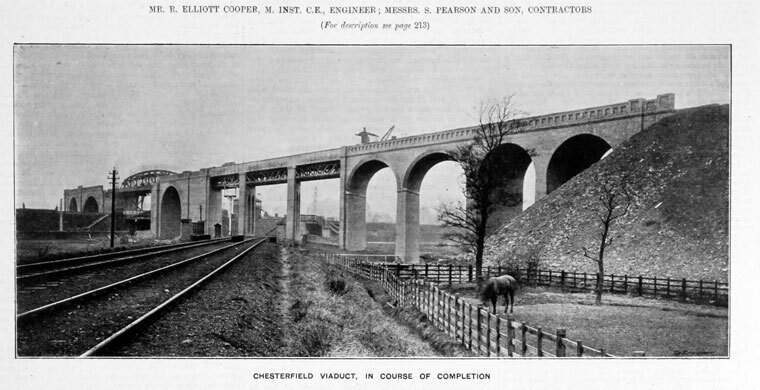 Chesterfield Viaduct in course of construction. 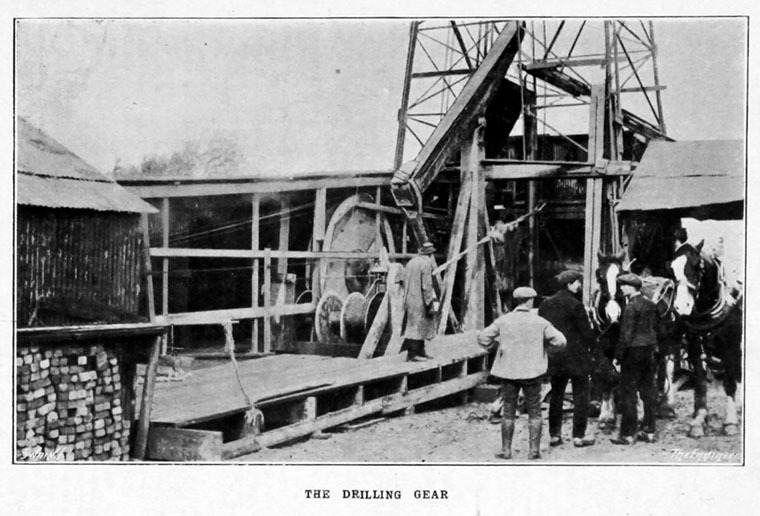 Oil exploration in Derbyshire 1918. Originally a firm of builders and contractors, of Bradford and later Westminster; later a family company holding interests in a diverse range of businesses (post WWII). 1844 Began as a small brickmaking and contracting company, founded by Samuel Pearson. c. 1871 George's son, Weetman Dickinson Pearson, left school at sixteen and was apprenticed to the family firm. 1877 Weetman was sent to the USA to seek new business, especially orders for the bricks, tiles, and piping whose manufacture was a major concern of the firm. 1879 Samuel retired and gave his share in the firm to Weetman, who became the sole partner of his father, George Pearson (1834-1899). 1884 Headquarters moved to London. Under Weetman's leadership, Pearson became one of the world's largest building contractors, working in Europe, China and Latin America. Late 80s: Major dock construction projects at Milford Haven (1885-90), Southampton (1886–91), and Halifax, Nova Scotia (1886–9). 1889 Won major contracts in the United States (to build the Hudson River tunnel) and Mexico (to construct the Grand Canal to drain the swamps of Mexico City) which secured Pearson's leading role as a British contractor. 1891-7 Contractors for the Blackwall Tunnel, dug using a pneumatic shield. Acquired and reconstructed the Wouldham Cement Works for the purpose of manufacturing the cement required for their various contracts. 1897 Private limited company S. Pearson and Son incorporated to acquire the contracting business of S. Pearson and Son; paid up capital = £1 million. 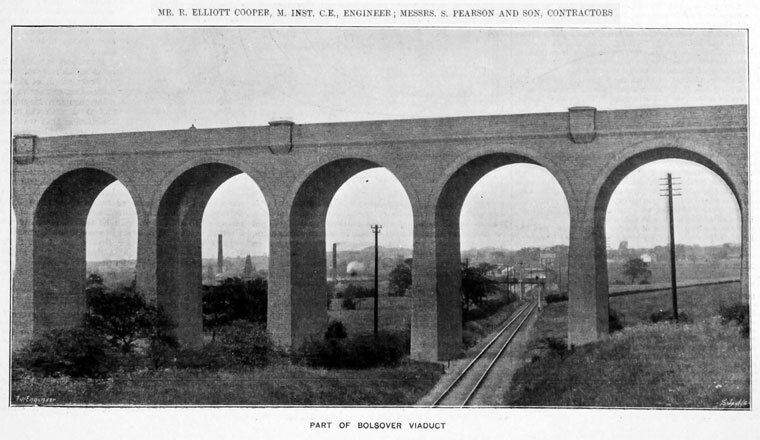 1900s Built the four East River tunnels connecting New York with Long Island for the Pennsylvania, New York, and Long Island Railroad Company. As a result of the involvement in construction work in Mexico, oil seepages were discovered. 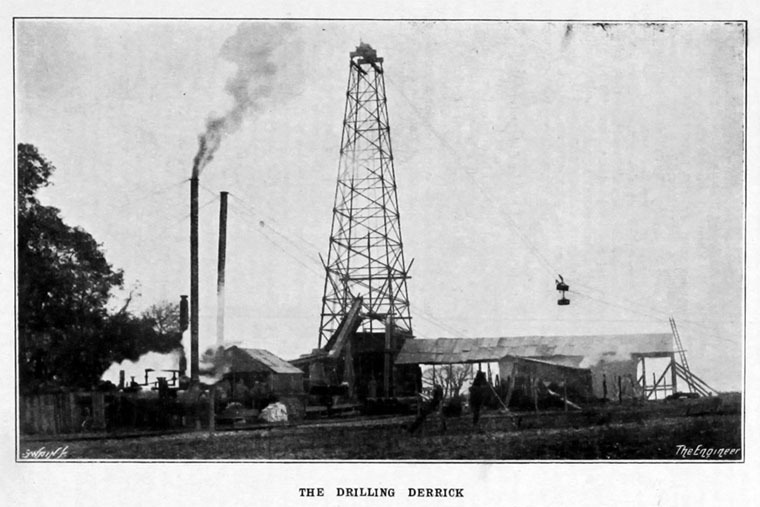 In April 1901 Weetman, spending a night in Laredo, saw something of the large oil discoveries in the Texas oilfields. He began to acquire oil concessions. 1903 Established a generating station at a cost of £2,400,000 in the mountains of Puebla, where a n abundance of water power was hoped to be found to transmit a current of 80,000 horse-power to the city for commercial uses. By 1907 the firm owned 600,000 acres of land in Mexico. Pearson invested heavily in refining facilities and shipping but found relatively little oil which put them in a precarious financial position. 1909 Mexican Eagle Petroleum Co acquired from S. Pearson and Son their oil concessions and interests in parts of Mexico. 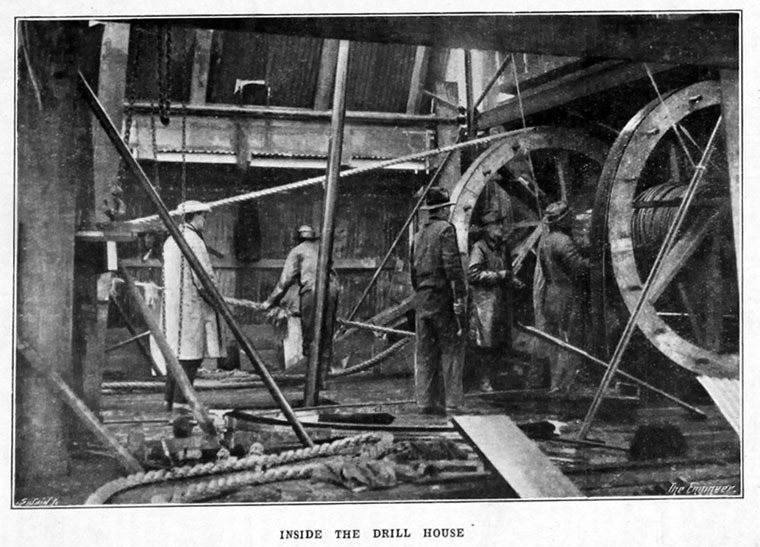 1910 Pearson's drillers struck oil on an enormous scale in Mexico. 1913 Contractors for the work of a new Dock adjoining the Victoria and Albert Dock. By 1914 Mexico had become the third largest oil producing country in the world, and Pearsons controlled about 60 per cent of this production. Created a large, vertically integrated business which controlled oil production, refining, distribution, and selling. WWI Purchased an interest in Lazard Brothers and Co, equally shared with Lazard Freres. 1919 Shell-Royal Dutch acquired a controlling interest in Mexican Eagle Oil company by purchasing the shares owned by S. Pearson and Son. 1919 Oil discoveries in the USA; Weetman participated in the formation of the Amerada Petroleum Corporation. Contractor for the Sennar Dam project in the Sudan. 1922 New JV company formed with Dorman, Long and Co to exploit coal measures at Betteshanger in Kent; the company was called Pearson and Dorman Long Ltd.
1934 Sir Clarendon Hyde, partner in the business, died. c.1935 Weetman's second son, (Bernard) Clive Pearson, became chairman. 1941 Their holding in Amerada Petroleum was compulsorily acquired by the British Government. 1940s The company's main aviation activities were nationalized, as were its coal mines and electricity undertakings in the West of England. Early 50s bought a controlling interest in Financial News  and Lawley Group. 1954 Clive's nephew, Weetman John Churchill Pearson, became increasingly involved in the affairs of the family company, taking over as chairman when his uncle retired in 1954. The company had a controlling interest in Lazards, the merchant bank, and a variety of other financial and industrial investments, including Westminster Press, a chain of provincial newspapers. Over the next twenty-three years, the company was transformed by acquisition into a broadly based and highly profitable industrial group by buying well-managed firms which had a strong position in niche markets and which were capable of being developed over the long term. 1959 Having developed Saunders-Roe Ltd, this was sold to Westland Aircraft. 1962 Having developed Acton Bolt Ltd this was sold to GKN. 1963 Bought a large shareholding in Château Latour in association with Harvey's of Bristol. 1964 Acquired Royal Crown Derby to become part of Allied English Potteries Group. 1967 Standard Industrial Group (SIG) purchased 58% of Allied English Potteries in exchange for 8 million shares which gave S. Pearson and Son a majority holding in SIG. 1969 Became a public company with 5 divisions of roughly equal profit contribution - Banking and Finance, Investment Trusts, Newspapers and Publishing, Oil, Industrial. Oil interests in Canada and USA were transferred to Ashland Oil and Refining Co, in exchange for an interest in that publically quoted company. Several of the subsidiaries were quoted at the time of the flotation of the parent company, including S. Pearson (Publishers) . 1971 Acquired Doulton and Co and the outstanding interests in Allied English Potteries that it did not already own. 1977 Weetman John Churchill Pearson retired from the chairmanship. 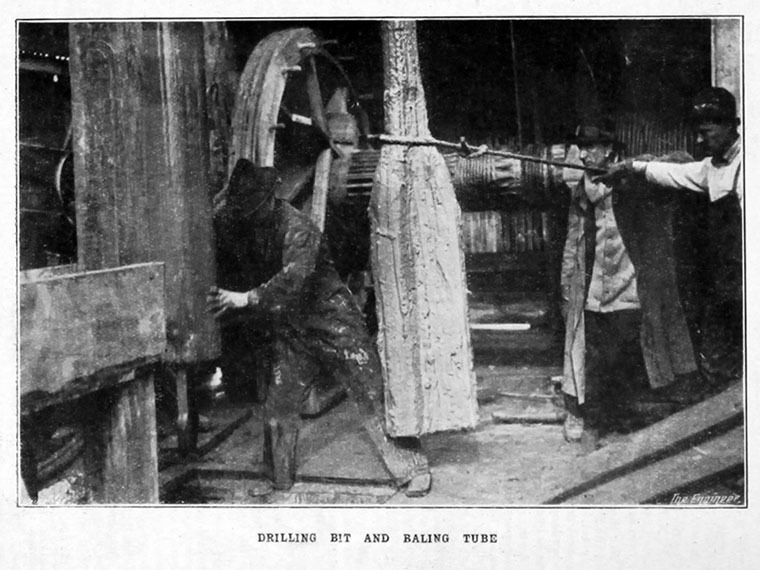 ↑ The Engineer 1903/01/02 p 26. This page was last edited on 3 February 2017, at 11:40.